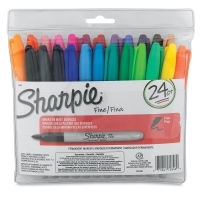 Mark almost anything with bright, lasting color! 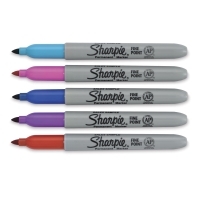 The Sharpie Fine Point Marker has a tough, resilient 0.5 mm tip. Permanent ink is fast drying, quick flowing, and resists water. 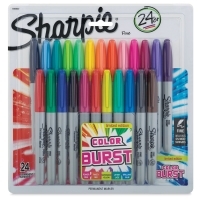 Set of 23, 50th Anniversary Set — Since 1964, Sharpie has been offering ways to add color and creativity to art projects, drawings, illustrations, schoolwork, and more. 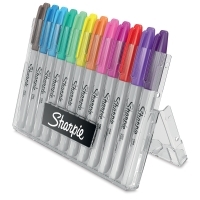 Help Sharpie celebrate its 50th anniversary with the "50 Ways to Use Sharpie" Anniversary Set! 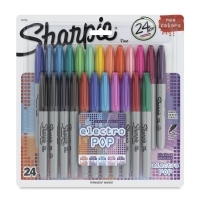 This special edition set of 23 Fine Point Sharpies (0.5 mm tip) includes 16 regular colors, four neon colors, and three metallic colors. The permanent ink is fast-drying, quick-flowing, and water-resistant. 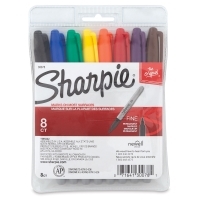 A usage guide provides inspiring tips for using your Sharpies. 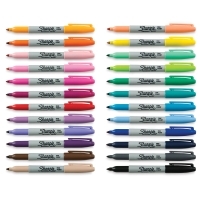 Set of 24, Assorted Colors — Colors vary. Be Bold Lettering Kit — Dare to create bold freehand letters and designs that extend beyond the lines and break all boundaries! 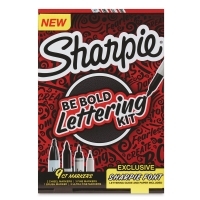 The Sharpie Be Bold Lettering Kit offers the tools and tips to make freestyle YOUR style. Includes eight markers (two Black Ultra Fine Tip, three Black Fine Tip, two Black Chisel Tip, and one Black Brush), an instruction book, and tracing paper. Set of 24, Assorted with Electro Pop Colors — Set includes the colors Aqua, Berry, Black, Blue, Blue Ice, Brown, Electric Pink, Green, Lime, Magenta, Mint, Nano Blue, Navy, Optic Orange, Orange, Peach, Pink Lemonade, Purple, Red, Slate Grey, Techno Blue, Turquoise Blue, Ultra Violet, and Yellow. Set of 12, Assorted Colors — Set includes the colors Black, Yellow, Purple, Red, Green, Brown, Orange, Blue, Aqua, Berry, Lime, and Turquoise. Set of 5, Cosmic Colors — Set includes the colors Boysenberry, Navy, Aqua, Venus Green, and Jupiter Red. 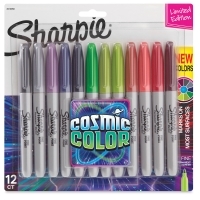 Set of 12, Cosmic Colors — Set includes the colors Dark Matter Gray, Celestial Gray, Boysenberry, Intergalactic Indigo, Navy, Galaxy Green, Martian Green, Venus Green, Orion Orange, Solar Flare Red, Jupiter Red, and Rocket Fuel Red. Set of 5, Electro Pop Colors — Set includes the colors Electric Pink, Nano Blue, Optic Orange, Techno Blue, and Ultra Violet. 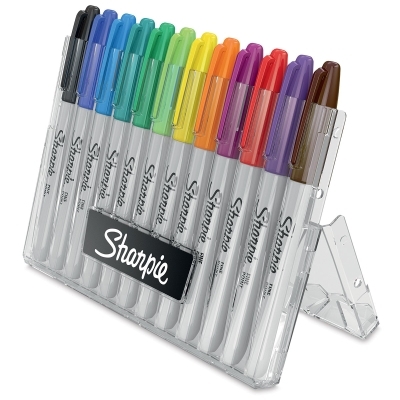 Set of 8, Assorted Colors — Set includes the colors Red, Green, Blue, Black, Yellow, Purple, Orange, and Brown. 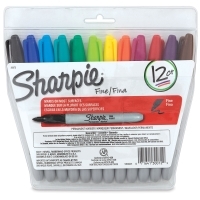 Set of 12, Hero Pack, Vibrant Colors — Sharpie Marker Hero Packs include a unique combination of 12 colors not found in any other Sharpie pack, in durable, reusable cases that open into an easel stand for easy access. These packs include one each of Slate Grey, Brilliant Blue, Nano Blue, Jetset Jade, Mint, Supersonic Yellow, Tangerine, Jellie Pink, Magenta, Racey Red, Ultra Violet, and Valley Girl Violet. 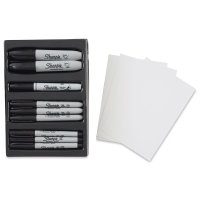 Set of 12, Hero Packs, Original Colors — Sharpie Marker Hero Packs include a unique combination of 12 colors not found in any other Sharpie pack, in durable, reusable cases that open into an easel stand for easy access. 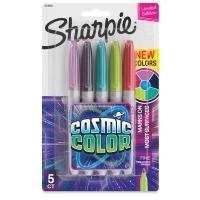 These packs include one each of Black, Blue, Turquoise, Aqua, Green, Lime, Yellow, Orange, Berry, Red, Purple, and Brown. 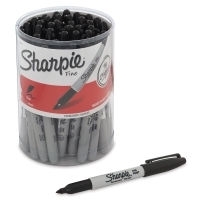 Class Pack of 36, Black — This canister holds 36 Black Sharpie Fine Point Markers, ideal for classrooms. 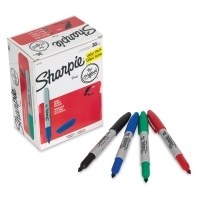 Set of 36, Value Pack, Assorted Colors — This pack includes 36 markers, 10 each of Black, Blue, and Red, and six Green markers. 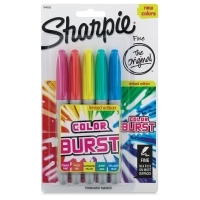 Set of 5, Color Burst Colors — This set includes Power Pink, Racey Red, Supersonic Yellow, Jetset Jade, and Brilliant Blue. Set of 24, Assorted with Color Burst Colors — This set includes Power Pink, Racey Red, Supersonic Yellow, Jetset Jade, Brilliant Blue, Aqua, Berry, Black, Blue, Blue Ice, Brown, Green, Lime, Magenta, Mint, Navy, Orange, Peach, Pink Lemonade, Purple, Red, Slate Gray, Turquoise Blue, and Yellow.